Temple B'nai Israel will be holding a Community Passover Seder on April 19th, at 6 pm, at the Temple. The community is invited. Chef Pat Nolan will be catering the event. Cost is $50/person. Menu selections are brisket, chicken or vegetarain. Reservations are required by April 11th. Payment is due with the reservation. We accept cash, check or PayPal. Call 318-387-0730 for more information and reservations. Congregation B'nai Israel, fondly known as the "the Temple", is located in Monroe, Louisiana which is on the banks of the ​Ouachita River and Bayou DeSiard. The Temple is truly a congregation of volunteers, who put in countless hours because of their love for Judaism and their desire for a strong Jewish community, committed to the values and conduct of the individual, the family and the society in which we live. As members of the URJ, we extend a warm welcome to all who are seeking a Jewish community built on the fundamental and ​enduring principles of Reform Judaism. 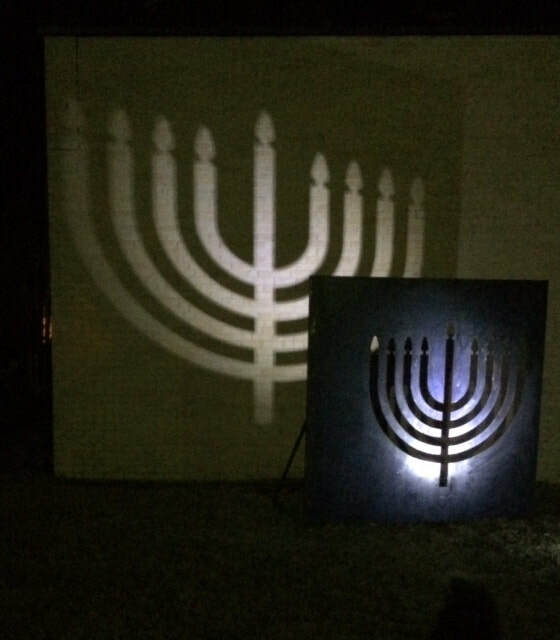 Temple B'nai Israel now has a beautiful new art work that can be seen at night on the Park Avenue side of the building. This work was designed by Mr. Doyle Jeter, artist is residence at the University of Louisiana Monroe, and fabricated by Sol's Steel and Pipe. There will be a reception and dedication of the art work on March 29th at 7:00 pm. The public is invited.